Welcome to Best Thing We Ate This Week, where each week, we'll have a special guest or Thrillist staff member talk about a New York dish they recently tried and loved. This week, Last Week Tonight with John Oliver writer and comedian Josh Gondelman talks about the Tater Heaven: Williamsburg’s most underrated diner breakfast/midnight snack. Very few things in this world live up to their billing, but the Tater Heaven from Jimmy’s Diner in Williamsburg comes exactly as advertised. 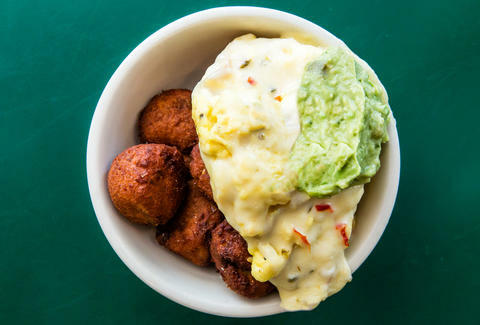 To be precise, ascension to the starchy afterlife consists of tater tots (constructed more like fritters) hidden under a layer of scrambled eggs, onions, and pepper jack cheese, and topped with guacamole. It’s constructed like a meal you’d make in your own kitchen out of the last five ingredients you have around, and then make for yourself once a week for your entire life after that. It’s comfort food for when you want to feel embarrassingly comfortable, like a T-shirt and sweatpants so threadbare, you’d force your hand through a crack in the door to sign for a package rather than risk being seen by the mail carrier. In my experience, the best way to enjoy the Tater Heaven while mitigating the fear of your own death being imminent is to order it with a side of sautéed kale (also delicious) and fold the greens in at intervals, to reinforce the dish with nutrition the way rebar fortifies concrete.